"The sky was clear. It was just like a comet, with a bright long tail. 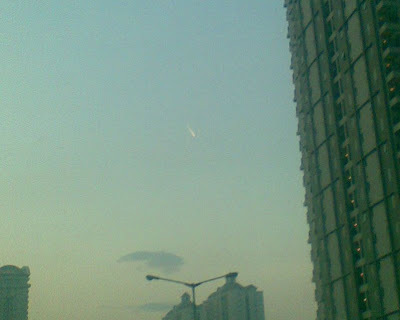 I saw it at 05:57 PM [10:57 UTC] and took a picture from my cellphone... It traveled downward very fast." Below, you can see the object in the center of the picture. Also beneath that, is a close-up of the unknown object. My best guess is that it was a piece of debris from the recent collision between Cosmos 2251 and Iridium 33. If anyone else saw this event or caught it in a photo, leave a comment below! 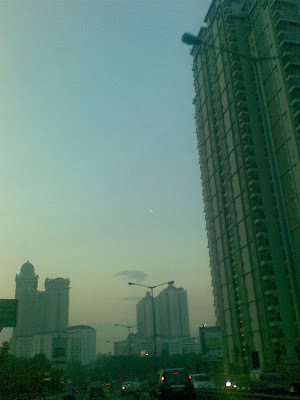 Unknown re-entrant captured by Ferzeno in Jakarta, Indonesia. Image captured March 11th, 2009 at 10:57 UTC. Terrific! Now I’m for that reason content to read this. It also is normally really make a difference about thrilled which I came to discover approximately any model express by your internet site. At this time follow here cash advance Regards quite a lot just for revealing to others approximately any model express. Continue.